This post is for all those friends who live for two wheels on the asphalt. 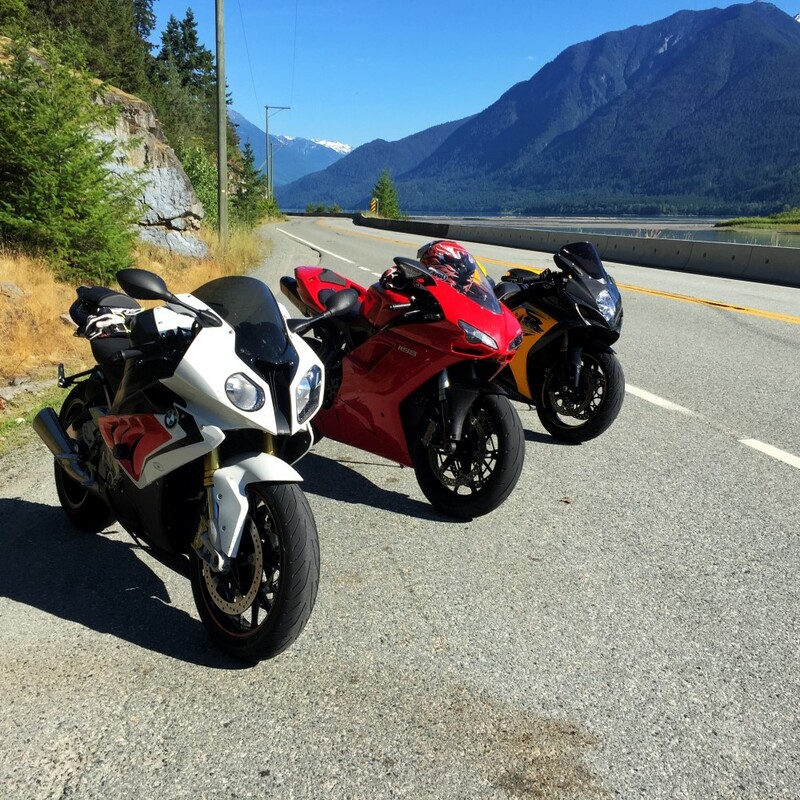 Living in the Whistler, I am lucky to live on what is often voted one of the best biking roads in the country – The Sea to Sky Highway. She is a winding thing of beauty which attracts and woos bikers from all over, and I get to ride this stretch of road every single day. The bikes are prepared – a full tank of gas, tire pressures assessed, and toolkits packed just in case something were to come loose. The jackets are taken off the hangers, helmets on, and we’re ready to depart. Nothing beats the first part of the ride. I cannot count the number of times I have ridden this road, but it never ceases to excite me. The Duffy Lake Road winds through the mountains between Pemberton and Lillooet. There is plenty to see, and plenty of explore: Joffre Lakes, Duffey Lake, campgrounds, and trails for other types of bikers all over. Since we are on two wheels, however, we are concentrating solely on the highway. The road is a snaking pathway through the valley, with plenty of exciting corners rounding beautiful vistas. Passing Lillooet, we continue north and the road opens up to much larger but equally as impressive valleys. It’s swelteringly hot up here, but it doesn’t detract from the fun of the ride. Marble Canyon is always a favourite stopping point, with some shady trees to kick back and relax for a while. The further north we travel, the more and the canyons and valleys open up to green farm lands. By now, we are not far from Cache Creek. Turning onto Highway 1 – the Trans Canada Highway – we are rewarded with huge valleys, rivers, and lakes en route to Kamloops. Finally, as the sun starts to set, we find ourselves on the final stretch through the rustic hills towards Vernon, at the northern end of the Okanagan valley. We find our first stop for the night – Fairfield Inn & Suites by Marriott – put the bikes to bed, and head to a nearby bar for a bite to eat and a couple of brews. Directly, this trip due south would only take a few hours. But instead of going direct, we’re taking a trip towards the Kootenay region. We head East along Highway 6, and find ourselves some exciting curves along the route to Fauqier. 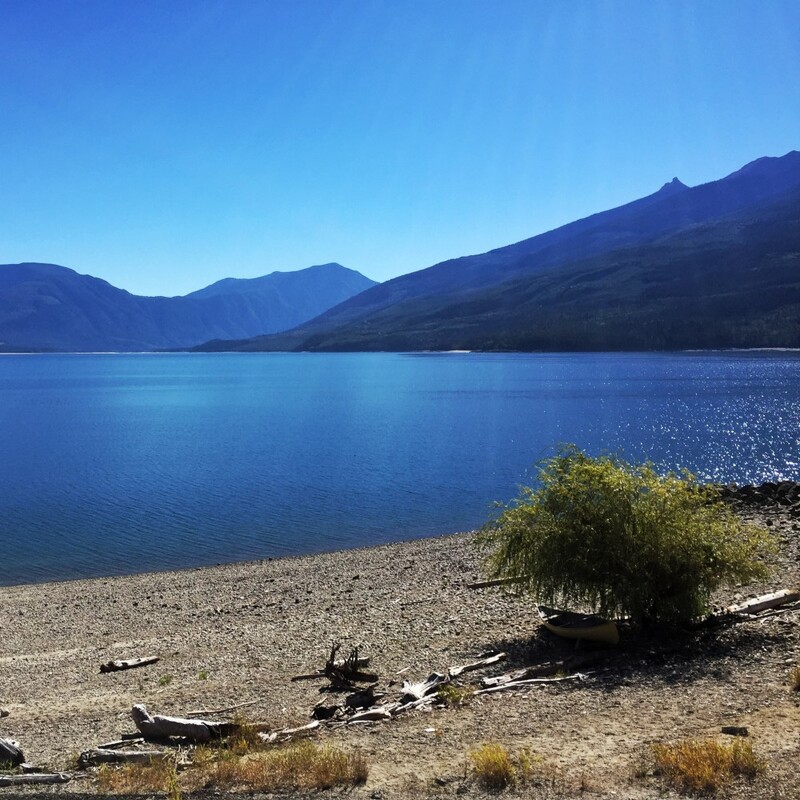 Crossing Upper Arrow Lake requires a short ferry ride – again, a perfect opportunity to dismount and enjoy the spectacular views. 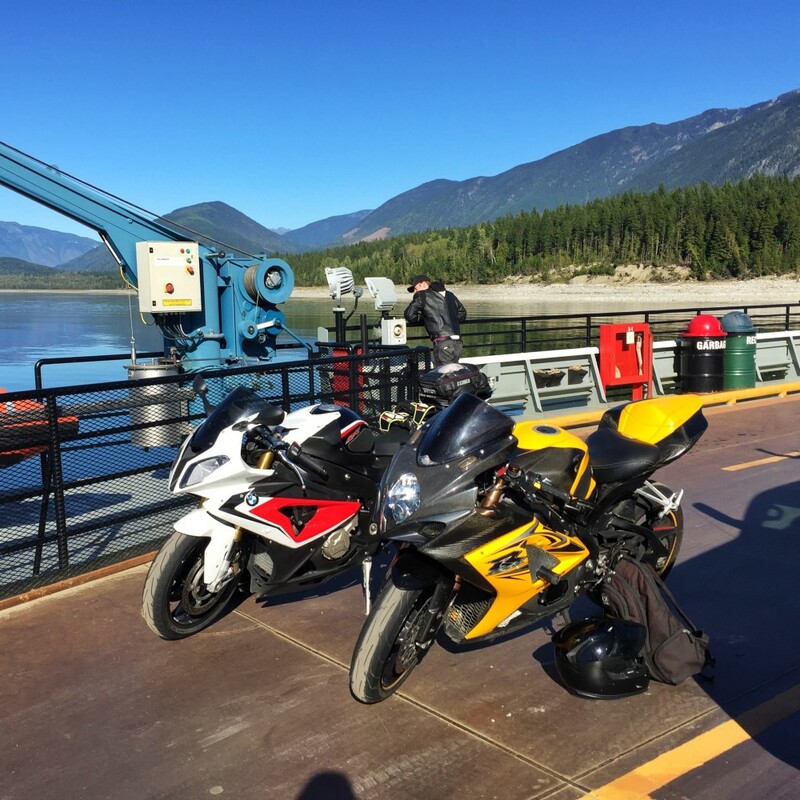 Half an hour later, we hit dry land once again and the journey towards Nakusp continues. It’s absolutely stunning around here. We fuel up in Nakusp, and have a conversation with the enthusiastic shopkeeper about which roads we should take next. 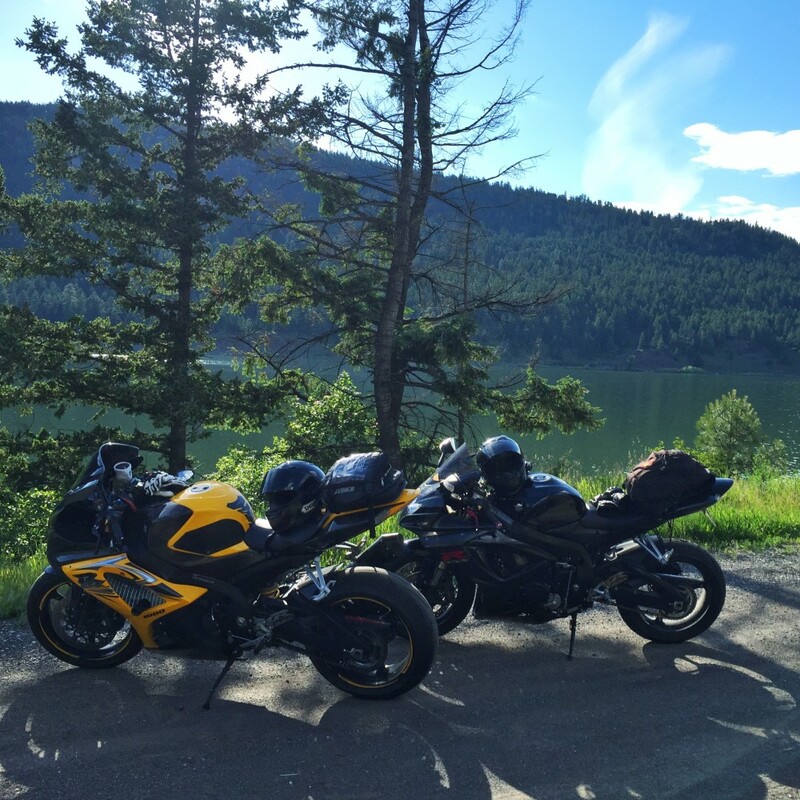 We are still on Highway 6, but now heading due south towards New Denver – a sleepy little lakeside community, but one which comes with smooth roads, incredible views, and perfect riding. We stop briefly in the town, and find a tasty little sandwich bar for some late lunch. Eager to keep exploring, however, we don’t stop for long, and soon enough we are back on the roads heading south. Slocan Lake is just as beautiul as Upper Arrow Lake, and I make a mental note that I must return sometime to explore for longer. Upon reaching Castlegar, our journey takes us West again, along the very southern border of British Columbia, back to Osoyoos. The highway takes us along some high mountain passes, as well as along some large green fields. As the sun is starting to fade away, we find ourselves descending the final mountain down to our destination. 700km crouched over a sports bike has definitely taken its toll on my muscles and my energy levels, but my spirits are high and that’s enough to make it worthwhile. Our stop tonight is nothing fancy – Super 8 Motel – but it has a pool, a hot tub, and that’s all you need! We awake on the last day of our journey , for an ever so familiar route back home. Leaving Osoyoos along Highway 3 takes us first through the Similkameen valley, The Okanagan’s little sister in the wine producing industry. Once in Princeton, we veer north towards Merritt. The roads are great, passing small communities and lakes, and eventually we find ourselves back at Spences Bridge. A quick jaunt along the Trans Canada again takes us along the banks of the ever-so-impressive Fraser Canyon back to Lytton. We fill up one last time, and head back towards Lillooet. As we complete the loop, we find ourselves once again back on the Duffey Lake Road, with nothing but smiles as, for the second time, we travel along the best road of the trip.